As darkness falls on these balmy July evenings, the famous "Summer Triangle" is high in the eastern night sky. This seasonal triangle is composed of three of the brightest stars in the night sky, each of which is the brightest star in its own constellation. The brightest of the bunch is the bluish-white star Vega in Lyra, the Lyre. Next up is the yellow-white Altair in Aquila, the Eagle, with the white Deneb,in Cygnus, the Swan, rounding out the trio. Sometimes when I find myself outdoors and giving an impromptu talk on the night sky, I’ll direct my audience’s attention to the Summer Triangle. Then I’ll ask two questions. First, what order of brightness are the three stars, from the brightest to the faintest? This question is rather easy to answer since it is obvious that Vega is by far the brightest of the trio, appearing to shine twice as bright as Altair and more than three times brighter than Deneb. If someone fails to understand the difference between brightness and luminosity, I’ll bring up the following analogy: Pretend you’re outside at night with two friends. One of them has a powerful 5-cell flashlight and the other a tiny penlight flashlight. Your friend with the 5-cell flashlight walks a distance of 600 feet before he turns the light on and ultimately shines it toward you. Now your other friend walks a distance of only 10 feet, and from that distance shines the tiny penlight bulb in your direction. Question: From your vantage point, which appears brighter: the light from the 5-cell flashlight or the much-smaller penlight flashlight? Obviously, it is the penlight. But now, which light is more luminous? It is 5-cell flashlight, but since it is 60 times farther away, it doesn’t appear as bright as the much closer penlight! The same explanation can be used when speaking of the luminosity of the three stars in our Summer Triangle. Astronomers know that Vega clearly is more luminous compared to Altair, because it’s situated at a greater distance from us. Altair is just 17 light-years away, while Vega is 25 light-years away. So, the light you see from Vega tonight started on its journey to Earth back in 1987; from Altair we’re looking at light from 1995. Compared to our sun, Altair is about 1 1/2 times larger and nine times brighter. Vega, however, is more than three times larger and 58 times more luminous. But both Vega and Altair pale in comparison with Deneb, one of the greatest supergiant stars known. Deneb’s distance measures 1,500 light-years from Earth and the star possesses a luminosity now computed to be more than 85,000 times that of our sun. Astronomers utilize absolute magnitudes for stars in which the lower the number, the brighter the object. This is the brightness that a star would have if all the stars were placed at the same distance from us. That distance is equal to 10 parsecs, or 32.6 light-years. Were we able to move our sun out to this distance, it would appear to shine at a paltry magnitude of +4.8, meaning that it would appear as a moderately faint star; most people would need a night sky chart in order to identify it. Altair would appear to shine at magnitude +2.1, just a trifle fainter than Polaris, the North Star. Vega would glow at magnitude +0.6, just a little brighter than Altair appears to us. But Deneb would appear absolutely dazzling. Shining at magnitude –7.5, it would be readily visible both night and day, and appearing nearly 13 times brighter than Venus! 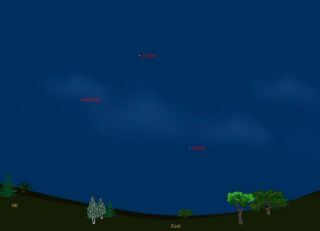 But because its light takes fully 15 centuries to reach us, Deneb merely appears in our summer sky as a fairly conspicuous but by no means particularly notable star. Which only goes to prove that even in astronomy, looks can be deceiving.